For Lawson, the horrors that stalked the Civil War battlefield at Shiloh were more than just those of war. After being forcibly given the gift of undeath by the mysterious vampire queen LaRouge, Lawson chose to cling to what remained of his humanity and fought his way free of the Dark Societys clutches. In the decades since, he has roamed late nineteenth-century America, doing what good he can as he travels by night, combating evils mundane and supernatural, and always seeking the key to regaining a mortal life. A world where a man travels by the night, he become one not that of humanity amongst the plains of the confederate battlefields at the age of 27, Wounded on the battlefield at Shiloh on the sixth of April 1862 this marked his journey into becoming something else. His battle is aided by one friend a priest, he helps quench his thirst via the consumption of cattle blood. In the present he is A gunslinger. A man caught between two worlds with fangs but a very human pulsating heart dying to overthrow the presence of the inhuman. He is a hired gunslinger and his new job undertakes handing 666 dollars in ransom for the safe return of a woman, he soon discovers that more than a woman’s safe return is in the balance. He battles with one in the world who he has not yet set his eyes on before, a shape-shifter of a different kind. 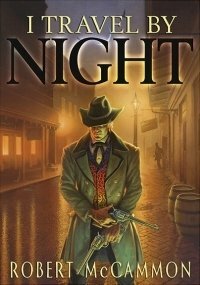 Equipped with two guns a Colt and a Derringer loaded with 2 different bullets for 2 different species and wearing a Stetson he goes in search for la Nocturne city. This story, is another example of the great storytelling capabilities of the author and his successful contribution to the writing world dealing with supernatural, he is a great writing force that i hope to remain for many a day to come. The author has crafted a memorable character in the form of this vampire gunslinger who is with fangs but with a very human Heart battling and beating away against time. An awesome tale from a writer who knows how to weave a horror with a very human character at his core, with a twist the supernatural, gothic and mysterious.